The sun is the ultimate source of light and heat for planet Earth and sets in motion very large and complex systems that develop and sustain life. One such land-based ecosystem is the forest, supporting a biodiverse set of plants, which in turn provide food for other living things. Several distinct types of woodland habitats exist on Earth, such as conifer, deciduous and mixed. 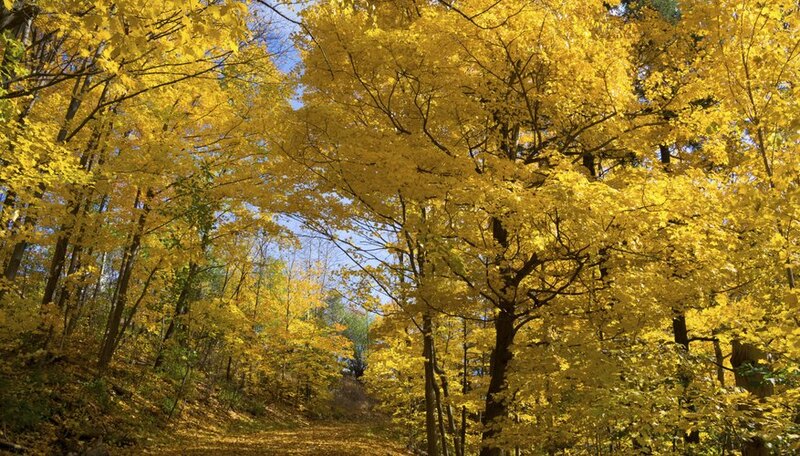 A study of the deciduous forest shows how a food chain functions within an ecosystem that experiences distinct seasonal changes. In contrast to the coniferous forest, whose trees generally do not lose their leaves each year, the deciduous forest is characterized by the prevalence of flowering trees, bushes and shrubs, most of which lose their leaves when the weather turns colder and the period of light each day grows shorter. Such trees and plants enter a state of dormancy in the winter, an adaptation designed to preserve life when energy sources diminish. The food chain within the deciduous forest comprises "producers," "consumers" and "decomposers." At the beginning of the chain is the sun, which turns plants into producers. When the sun’s energy in the form of light and heat strikes the surface of a plant's leaf, a photosensitive molecule called chlorophyll stimulates a process called photosynthesis, a series of chemical reactions that convert the sun’s energy into sugar molecules. These molecules store the energy to be used later by the plant and ultimately by those organisms that use the plant for food. Part of this energy goes to the production of seeds, which carry the genetic code to further the species. Another outcome of photosynthesis is the production of oxygen and the absorption of carbon in the form of carbon dioxide gas. The producers of food in a deciduous forest are the trees and plants that convert sunlight to mass and stored energy. These plants subsequently become the basic food source for the consumers above them in the food chain: for example, insects, birds, rodents and deer eat the leaves and other parts of the plants, taking on their stored energy as sustenance. However, symbiosis also occurs, whereby organisms of different species operate under a kind of cooperative arrangement, such as when honeybees pollinate plants as they collect nectar. In addition, bacteria in the soil break down nutrients to a form readily usable by the root systems of plants. Within the deciduous forest habitat's food chain, the consumers are organisms that are unable to produce their own food and must eat other organisms to survive. Consumers can be of a primary, secondary or tertiary type. Primary consumers include the insects, rodents and larger herbivores that eat mainly plants, grasses, seeds and berries. Secondary consumers include predatory birds, such as owls and hawks, and other small predators like foxes and skunks, which eat insects and rodents. Tertiary consumers, said to be at the "top" of the food chain, are predators that prey on smaller animals below them in the food chain. All living things have a life span, and without a way to recycle dead organisms, the ecosystem would soon be filled with the remains of plant and animal life. Decomposers break down such remains by converting them to smaller and smaller parts, which ultimately become new soil. Bacteria and insects perform this function, as do fungi and certain larger scavengers. The resultant nutrient-rich soil becomes ideally suited for seeds to grow, beginning the cycle of life again. Beacom, Betsy. "Food Chains in the Deciduous Forest." Sciencing, https://sciencing.com/food-chains-deciduous-forest-7449795.html. 13 March 2018.